How to deal with extra IJN fighters? Totally agree , but it the capitan skill was supposed to give a chance of somewhat minimising the loss what happened was slaughter, anyway I have adapted tactics but it's scary how OP 6 plane squadron is. 4 km torpedo with 70 kn is good but you have to get there first no matter how fast you are if you are going on a strait line you can be lead out target and if you turn your speed drops, so US DDs will be outmached but IJNs we will have to wait and see. 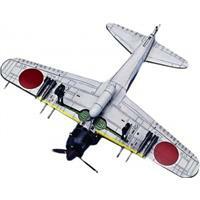 I have sold my CA and BB so I have plenty of room for SN DiDy, I hope they will be good earners as the IJN ones. I think that ninjas can do reasonably with hit and run tactics even if SN DD is extremely OP, no matter what they will have a CA bane. Any way I have the feeling once the great repair bills start SN DDs will be some of the primary targets The greatest advantage wil be the faster torpedos but if it has 5 km range it will be interesting to launch it. Manual aiming is the key to victory, for DB, and I personaly think that for small and agile targets like DD DB are much more useful than TB, since a good DD driver can be very elusive even with 60kn killer chasing him. I dont know how RNG affects manual aim But 2/4 and 3/4 hits with fires can be very nasty, and last but not least in IJN bombing doctrine TB were the finnishing aircraft, while in US it was the DBs. So no wonder why US torpedos take more time to arm and are slower, but US DBs have the potencial of ripping apart CA. So my point is they are god as they are. USN CV are too OP, people can't complain when Bougue fighter squadron shoots down monoplane fighters of IJN, so I'm saying that IJN are so nerfed that you can't even use your fighters on a low tier squadrons, and eventualy you run out of sky. I have lost a fine squadrons of Mitsubishi A5 to a Bougue biplane squads over neutral skies , after I have put thousands and thousands of credits gettin' ony fighter upgrades, and I personally think that USN CV are verry OP, even when you manage to do a decent sneak attack you still have atleast two Omahas round the island, so no IJN figthter is extra. So, anyone managed to use the fighter ability efficiently? Have you tried it on ships? Why are CVs overperforming on EU only? True, but even with auto aim you get aprox 60-75% chance of 2/4 hit ratio on low tier BB if you are lucky/tricky enough to get there. Having in mind that BBs can be spotted from the other edge of the map 20 sec. reload can be a verry long time even if you have the perfect trajectory. And if the enemy fighters are chasing emty bombers they get rear gun fire and somewhat flack when bombers are going back to deck. 100% correct that's why I am following your youtube chanel but over all we have a problem with selfishness. Most of the players are catatonic when they have an open ocean map simply because they refuse to take the simpliest advise ever stay together- live together, personally I think that the more open ocean maps EU players have to play the more they will have to cooperate no matter the one ship fleet mentality. You can not deploy tactics relating on CA Flack, because you can't rely on them, and that results in complaining how the enemy ship is OP. In fact everybody on the team playing different class ship has it's powers for instance why shoud my TB groups die out of flack , when my team mates can cach that CA under crossfire and sink it? Because anyone is so selfish they don't even see the tactical maps up until 4:9 and at that point it's there isn't much you can do. In order to win the battle with IJN CV from my point of vew with low tiers cause I am a noob you have to be sneaky, bitchy, ninja and resourceful, now can anyone tell me what happens if you play US CV and get the level 5 captain trait and increase your squad +1 ? Come on, you cannot choose the raw mass and complain about the lack of mobility and tactical options. You clear the sky or you hunt ships that is a decent deal, further more you can employ barage strke on enemy group and guess what US fighters usually shred IJN bombing groups at the expence of 2 planes tops, sooo if you have a plan, stick with it, you can't be one ship fleet, and that's not what the game is all about. Have you tried setting a figther's barrage on their way instead of chasing them? I've got some lucky hits, but it was very dificult when the enemy was microing the attack. Dive bombers: I need help. Hi, I play with IJN Carriers myself and whenever my squads are not shredded from enemy fighters, I get decent bombing runs I do not have the nerve for manual attack, instead I use auto and give diagonal direction, or try to bomb portside to starboard side or vice versa, IJN group have four bombers Ideally the attack formation resembles a cross one up one down and one in every side, so by making a diagonal run you minimise the chanse of having the blank spot of the cross anyway it gives decent results, further more the actual IJN bombing doctrine was DB first and than Torpedo it gives good enough results, every one whants to put the fire out way faster and forgets about the realy nasty fludings anyway this can be done if you are not shreded by enemy fighters. Try some diagonal runs if it don't get the results you want, you can aways try with manual aim.